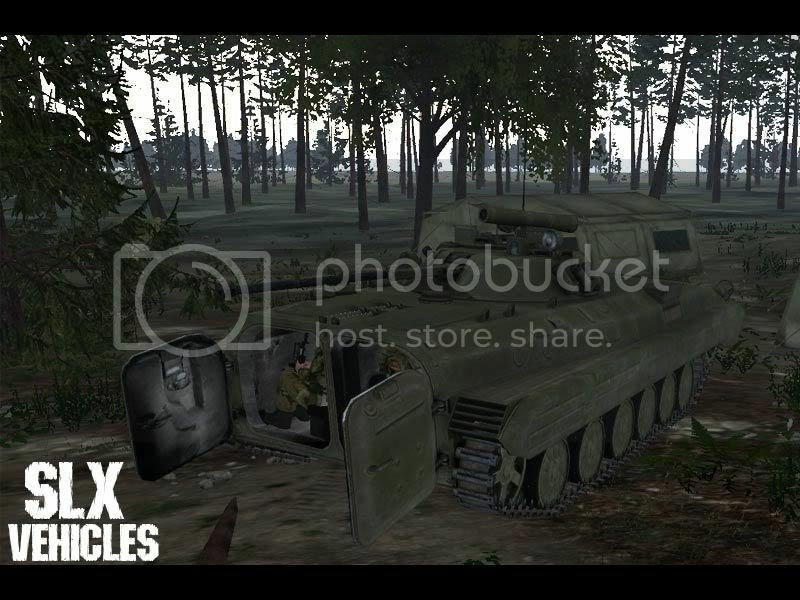 This was part of ArmA SLX mod but is now a separate release. Doors/ramps that open when people get in. Animated weapons(belts, bolts, feedtray covers, triggers, etc). Glass materials that don't get messed up by shadows, and shadows inside vehicles. Antennas that sway back when moving forward. The doors open to a random degree when the vehicle is destroyed. The scripts for each vehicle are hopefully open ended enough to be used with any vehicle, but shouldn't be too hard to modify for most. This is an unofficial addon, and is not connected with Bohemia Interactive. The maker of this software is not responsible for any harm that comes to anything resulting in the use of this software. All SLX releases are provided "as is" with no warranty or guarantee of support of any kind. This addon is subject to the BIS models license. All content in this addon may be modified and used in any way with or without credit, within the bounds of the BIS models license. All content copyright by it's respective author(s). There are some arma.rpt bugs about the shadows but I don't know how to fix them. There are some arma.rpt errors in some of the models but I don't have time to fix them. No damage textures inside BMP. Missing addon requirement of Extended_EventHandlers. Extended_EventHandlers is needed to make the door opening scripts work. It comes with a key and signatures that hopefully should work. I don't have any pictures, thanks to anyone that posts any! I won't have time to update this post so please post mirrors in the thread. Thanks for any mirrors! Awesome! Testing & making some screens right now! Edit: Amazing work, solus. Truly amazing! This is perfect! No fps drops whatsoever, and animated doors on vehicles, proper shadows on screens and moving parts while driving - thank you very much for this! do the same too, it'll be pimp; at least to me. There's something stupid, when I shoot the glass with handgun it brokes and split with the pieces, while humvee's glass is bulletproof... so handgun can make max a little scratch. Great job releasing this seperate Solus! Also the animation of the doors is triggered by you getting out, so it's really hard to have the doors open first then have you getting out. i guess this is an addon that the mission has to include and also the client? Does the server need to be running this addon as well? Yeah I would also love to see it in mcnools desert tex. SLX, I got a question, how about releasing dragging wounded/body as a separate? In my opinion its the best part of beta now. how about releasing dragging wounded/body as a separate? In my opinion its the best part of beta now. @Tomcat: I'm not 100% sure but IIRC you need to have it on the server and client, it doesn't have to be in the mission. @Vultar: I'm not sure if Solus still has acces to his computer or not, but he's moving houses so he won't be able to release anything soon. But the first public release of the whole mod is near! Mod is very good (the bad side of idea are engine's limitations). Through this mod, the Blackhawk's frontal windows, although breakable, are otherwise bullet-proof. I.e., you can't shoot the pilot out of his seat any more - not through the front, nor through the "back" (i.e. via the gunners' hatches). Since this is a "total replacement" type of mod (the default vehicles are replaced), this could potentially break missions, be a cheat in MP, and generally mess with people's day. But a great job otherwise! ArmA is getting better day by day! ELo guys..nice addons..have been waiting for this since the OFP days.!!! Just one little problem...the doors/ramps are not animated when i/AI getout/getin the HMMVs....the antenna though moves!!! ? Does anyone have a clue??? I noticed this amazing add-on is not entirely compatible with DM smoke effects add-on. When you destroy a car, m113, whatever... the ramp/doors does not work. If you remove DM smoke effects, it works. Missing addon requirement of Extended_EventHandlers. Are you using extended event handlers add-on too? Replacement pack of default units? or is that already what the add-ons do? When trying to make the server.exe load the add on it freezes and spams ArmA_Server.rpt with things like <table border="0" align="center" width="95%" cellpadding="0" cellspacing="0"><tr><td>Code Sample </td></tr><tr><td id="CODE">"Unrecognized texture type '.tga': 'ca\wheeled\data\uaz_main_co.tga'"
- my .rpt went beyond 110 MB. So, I suppose it's purely client-side, which is great! It seems a tad buggy in multiplayer. Doors open and close a couple of times when destroying a car / HMVEE. Maybe a conflict with some of the other add ons. I'll test it further. Yes, this add on will replace the default vehicles with the animated ones. There is no need for a replacement pack. hum, just an idea, is it possible to "delay" the actural get in action after we press get in so that the soldiers enter the vehicals after the doors are fully open? a bit too much" to cry for.